Taapsee took to Instagram to share the news with her fans besides sharing her look from the film. She wrote, "End of an another beautiful journey. #MissionMangal comes to an end for 'Kritika Aggarwal'. With such wonderful actors together in one frame it was truly an experience to treasure and cherish. 15-08-19 will be the celebration of this super power called India." In the monochrome picture, Taapsee is seen in a saree with her hair tied into a braid. She is also seen wearing a mangalsutra with a pearl-drop earrings. It seems like the 31-year-old actor has gone to great lengths to achieve this simple and elegant look for the flick. 'Mission Mangal' also stars Akshay Kumar, Vidya Balan, Sonakshi Sinha, Kirti Kulhari, Sharman Joshi, Nithya Menen among others. The biographical-drama is directed by Jagan Shakti and is co-produced by R Balki and Akshay Kumar. The film had gone on the floors in mid November last year. In November 2018, a copyright infringement lawsuit was filed against the makers of the film by the filmmaker Radha Bharadwaj. 'Mission Mangal' is based on India's 2013 space programme of Mangalyaan mission and will be co-produced by Fox Star Studios and Cape of Good Films. It will hit the screens on August 15, 2019. 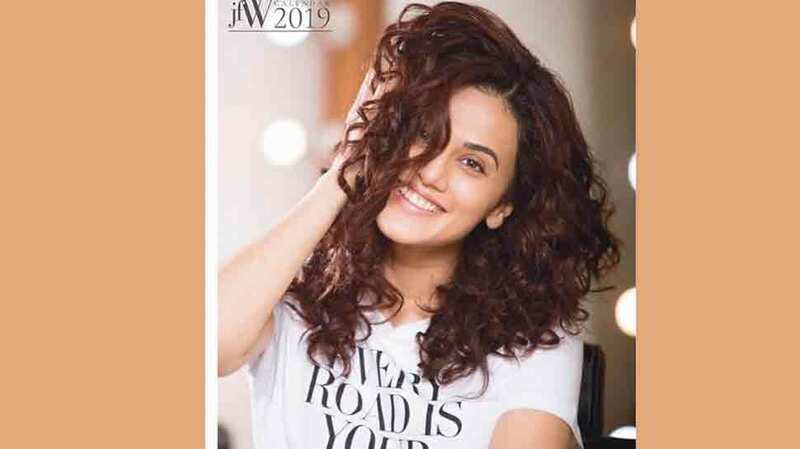 Taapsee, who was last seen in 'Mulk', is known for portraying versatile and different roles in movies like 'Pink', 'Baby', 'Judwaa 2', 'Naam Shabana'. She was last seen in 'Manmarziyaan' alongside Abhishek Bachchan and Vicky Kaushal. She has two more projects in her kitty — Sujoy Ghosh' 'Badla' and a romantic-comedy titled 'Badla', which is delayed.